The story of one little family doing the best that they can in the urban heart of Amish Country. Ben played baseball on Sunday. Sort of. We were at Owen's 8th birthday party and all the boys (and Isabel) and their dads started up a game. I, being me, didn't join in, but Ben wanted to. A few moments later, however, he came running back to me, clearly about to burst into tears. My assumption was that the other boys, all 3-4 years older than him, had refused to let him join. I was wrong. 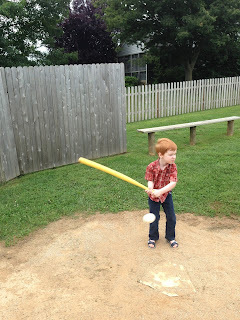 "Daddy," he whimpered, "I can't play because all the bats are gone." After I explained that only one bat at a time was needed, and that everyone would share, his smile returned and he headed back over to the field. It turned out, however, that he had no idea how to actually play. He understood that one was to stand in a certain place and hit the ball with the bat, but beyond that he was clueless. It's my fault, I suppose. Though I can enjoy myself at a baseball game, I have no love of sports, and so haven't passed on any skill or knowledge or interest in that area. In that picture there it looks like he knows what he's doing, but in person it was clear that he would have been more comfortable with a lightsaber in his hands. 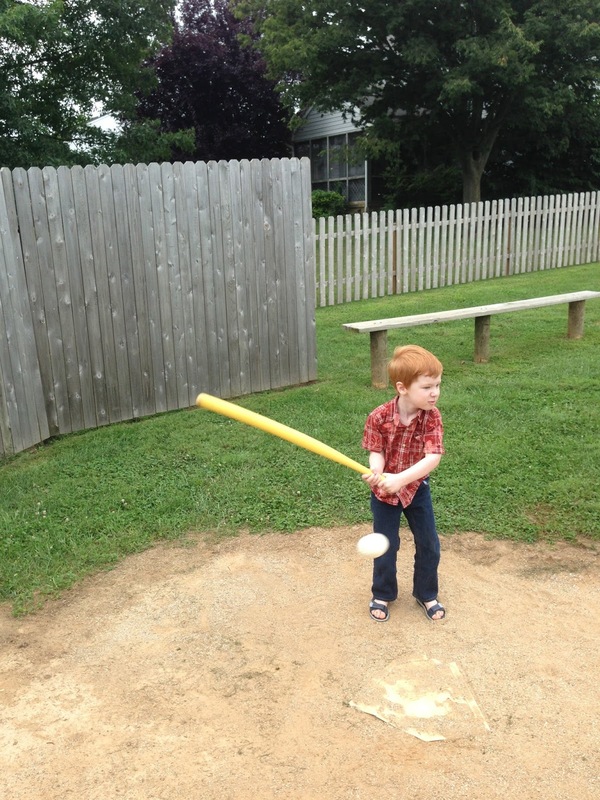 If Ben would like to play tee-ball, or any other sport, as a child, he will be welcome too, but I fear that it may never go too well for him. It certainly never did for me, though I kept trying right on up through middle school. When I took the picture to the right, I wondered to myself if he would be spending a lot of time on a bench in his future. 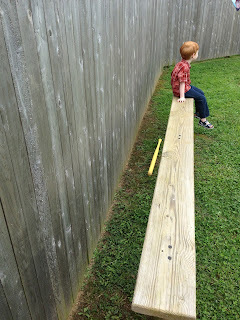 Then he promptly fell backwards and hit his head on the fence. As I carried him, crying, away from the field, he told me, "I don't like baseball. It's boring!" Don't worry kid, you're in the right family. We know he will be lacking in hand-eye coordination, but he has lots of energy and is pretty sure that he could take Usain Bolt in a foot race so sign the kid up for some fun runs. I even found a list of them for you http://www.roadracerunner.com/races/runningcalendar.aspx?state=pa&page=1&year=2013&d=Fun+Run,Kids+Run. Also there is a 2 mile glo-stick run in Ronks on 9/20 and a zombie run in Lititz in October that probably isn't appropriate for Ben, but you should do.